Evidence suggests the Politburo Standing Committee is in decline, while the central party bureaucracy gains more clout. It is commonly believed that an incoming General Secretary of the Chinese Communist Party (CCP) can enact whatever policies he chooses, so long as the top seven or nine leaders of the PBSC agree. If they do not agree, conventional wisdom presumes, then it is unlikely that the leaders will get much done. Such, at any rate, was the prevailing view at the start of Xi Jinping’s tenure. Analyses published at the time of Xi’s ascension confidently predicted that he would prove weak and achieve little, due to the challenge of gaining consensus among PBSC members of such varying backgrounds. Outcomes starkly at odds with such forecasts have done little to deter experts from making additional assertions following the same logic. It is not hard to find analyses today that claim Xi’s anti-corruption drive is fundamentally a power grab that is alienating fellow PBSC members and thus setting Xi up for long-term failure once his peers turn against him. Xi may well fail in his reform agenda for a variety of reasons, but lack of consensus in the PBSC will not be the primary driver. The importance of consensus for enacting policy between the top seven leaders who comprise the PBSC is overstated. Consensus remains necessary, at least on the surface, for the most important policy initiatives such as the pursuit of structural and systemic reforms under which the current anti-corruption drive is nestled. In reality, though, PBSC members are increasingly constrained in their ability to undermine or drastically change the general direction of policy. For the overwhelming majority of the country’s policy directives, what really counts is the degree of consensus within the central party bureaucracy, or staff organizations (i.e., the key staff bodies and organizations primarily in the Central Committee, such as the General Office, Central Policy Research Office, Central Party School, Organization Department, etc.) and between the same central party staff organizations and the General Secretary. Individuals who seek to anticipate the future trajectory of PRC policy-making would be well served to master the publicly available documents produced by these bureaucracies in support of the General Secretary. While the principle of infallibility has always been a feature of the party’s Leninist nature, the original revolutionary incarnation proved much more amenable to the usurpation of authority by members of the leadership elite. After all, when the logic of a political theory favors revolutionary overthrow, authority can accrue to anyone willing to promote the most radical vision. Indeed, chaos in Maoist China frequently owed to this problem, as competing personalities vied for the mantle of revolutionary authority and thereby drove government policy in the direction of their own political agendas. The party’s pursuit of a more technocratic style of politics in recent years retains the principle of infallibility, but has also narrowed and restricted its expression. To shore up the impression that its policies are derived from a scientifically rigorous intellectual methodology, CCP must invest as much energy elaborating its “theory system of socialism with Chinese characteristics,” as it does to develop sound policies that meet the needs of its people. Consequently, the most essential individuals and organizations in the CCP are those who can articulate the socialist theory system in a clear, consistent, and “scientific” manner, as well as those who can develop sound policies that promote the party’s objectives in a manner that validates the theory. It should be apparent already that a handful of busy individuals, especially those given extremely broad policy portfolios, lack the time and expertise to carry out this work. The individuals best positioned to meet these needs are those analysts, theorists, staff members, and experts who reside primarily within the permanent organizations of the Central Committee. These individuals collaborate on a continual basis to build the common understanding about China’s situation, develop theory concepts to guide policy, and outline the technical details of policy to shape elite opinion and support senior decision makers. The more effectively these staff organizations do their jobs, the easier it becomes for the Politburo Standing Committee to approve their recommendations and direct the implementation of policy accordingly. As a result, the consensus built by the central party bureaucracy under the supervision of the General Secretary has prevailed, and will likely continue to prevail, in setting the course for the nation’s policies. Another consequence has been an erosion of the power of individual PBSC members. The increasingly institutionalized nature of the political system requires PBSC leaders and other elite leaders to develop their own teams of theorists, analysts, and policy experts if they are to drive policy in a dramatically different direction. Chinese leaders have shown little inclination to empower individual members of the PBSC to overturn the consensus built by the central support staff under the General Secretary’s direction. The reduction in number of PBSC members from nine to seven, at the start of Xi’s tenure, suggests that even then the pursuit of PBSC-level consensus was increasingly viewed as more of a hindrance than a help to achieving party goals. More dramatically, the case of Zhou Yongkang demonstrates in a vivid fashion just how vulnerable members of the PBSC have become. Overall, the trend in recent years has been towards a strengthening of the General Secretary’s influence, and of the central support staff as the primary instrument of his power. While this consolidation has become most apparent under Xi, in many ways his tenure represents an intensification of trends well under way in the Hu era. The most important of these trends include: 1) an expansion and elevation of the central party bureaucracy’s role in policy making; 2) the systematization of the party’s ideology; and 3) the standardization of the party’s policy making processes. These reforms have generally strengthened the influence of political and technical experts in the central party bureaucracy and constrained the power of individual Politburo Standing Committee leaders. Expansion and elevation of Central Committee organizations in policy making. 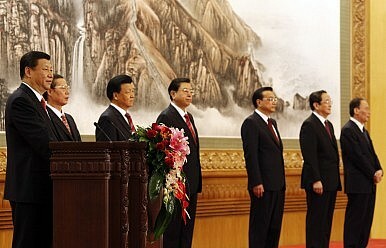 Both Hu Jintao and Xi Jinping invested considerable time and resources to strengthen their control of the central support staff. They also expanded and elevated the role of these staffs in the policy making process. The introduction of Politburo study sessions and expanded meetings in the 2002 time frame, for example, provided a regular venue for party experts to coach, mentor, and teach senior leaders, a function managed by the Central Policy Research Office (CPRO) and Central Committee General Office. Under Xi, the CPRO has also been designated the administrator of the Central Reform Office, which manages the all-important Central Leading Group for Deepening Comprehensive Reform, while the General Office administers the National Security Commission. Xi has also added two departments to the CPRO to handle the expansion in responsibility. Similarly, while head of the Central Party School (CPS) for ten years prior to his ascent to General Secretary, Hu oversaw a major expansion of the school. Xi also served for five years as director of CPS prior to his ascent. The CPS has become a principal think tank for the party’s theory work, as well as the premier training ground for senior leaders. Systematization of party theory. In 2004, Hu oversaw a major overhaul in party ideology to render it more functional and pragmatic, resulting in the theory system of socialism with Chinese characteristics. This multi-year effort systematized the various elements of the party ideology, keeping and refining those elements that could be useful for the new policy agenda and discarding the less useful parts. The end result was a modern ideology better suited to serving the CCP’s needs as a governing party. However, it has also empowered experts in the Central Committee as the resident authorities on how to define and articulate an increasingly technical, systematic, and specialized ideology. Standardization of party policy making processes. Beginning in 2002, the party saw a great expansion in the numbers and types of CCP rules, policies, and procedures to govern most aspects of party activity, to include recruitment, promotion, evaluation, and decision-making. To support policy making, the 16th Party Congress in 2002 also introduced and standardized a number of strategic objectives (zhanlüe mubiao), major strategic tasks (zhongda zhanlüe renwu), policy documents (such as the annual “Document Number One” for rural reform), and high level training events aimed at forging consensus behind the policy agenda set by the central leadership. The process of drafting key strategy and policy documents, to include Party Congress reports and Plenum decisions, has become increasingly routinized and the work largely led by experts in the central party bureaucracy. Officials of the central party bureaucracy also manage the training and education of cadres to carry out the agenda accordingly. In 2003, for example, central authorities began an annual training seminar for the nation’s provincial and ministerial level leaders in the most important theoretical concepts and policy priorities for the coming year. The increasing standardization of many of the party’s political processes constrains the ability of individual leaders to drive dramatic shifts in policy through informal, behind-the-scenes politicking. To be clear, much about Chinese politics remains poorly or only semi-institutionalized. Secrecy and behind-the-scenes politicking shroud many of the most sensitive political issues, such as the selection of individual leaders and other matters of elite politics. Nevertheless, a decade of ideological and political reform has resulted in a stronger central party bureaucracy capable of providing the cohesion, vision, and depth of expertise needed to help senior leaders carry out an expanded policy agenda aimed at providing more effective governance and realizing China’s rejuvenation. The relentless promotion of Xi as the most important leader among his peers, and the accretion of power in the hands of Xi through the creation of the National Security Commission and numerous small leading groups to carry out structural reforms, represents the culmination of these trends. The more Xi takes on responsibilities and new powers, after all, the more he depends on the experts, specialists, and officials of the central support staff to prepare and oversee the policies carried out under his direction. The strengthening of the central party bureaucracy has enabled the party to withstand the shocks of the Bo Xilai case, the arrest of senior officials such as Zhou and former CMC vice chair Xu Caihou, and the turmoil generated by the pervasive anti-corruption campaign. The evolving pattern of politics suggests that the common understanding of the relationship between the General Secretary, PBSC members, and the central support staff needs to be refined. General Secretary Xi and PBSC members continue to provide oversight of all policy work. The PBSC members also play a critical role in handling day-to-day decisions for their respective portfolios. However, the central party bureaucracy, under the General Secretary’s leadership, largely defines the “default” mode of policy through a dense network of mutually reinforcing theory, analysis, and central directives. PBSC members continue to play an important role through participation in the central leading groups, but the precise nature of the interactions remains hidden from view. What is clear is that the consensus forged through all of this activity, manifested most importantly in key policy documents such as speeches by the General Secretary and in Party Congress reports and plenum decisions, plays a decisive role in setting China’s policy agenda. Analysis of such documents will therefore likely continue to provide the most reliable insights into future trends of PRC policy. Ironically, just when the study of Chinese official documents, political processes, and ideology produced by the central party bureaucracy was becoming increasingly essential to understanding PRC politics, much of the China watching community turned its attention elsewhere. The prevailing mode of analysis remains focused on the personal networks, factions, interest groups, “princeling” connections, and individual backgrounds of PBSC members. Such research has provided fascinating insight into the dynamics of elite politics and reaffirmed the importance of personal networks in PRC politics. But this mode of analysis has provided little useful insight regarding the prospects for Chinese policy. Meanwhile, the few articles that have attempted to tackle key PRC policy documents merely demonstrate how much the study of such sources has deteriorated. One analysis published in 2012 dismissed analysis of Party Congress reports as a waste of time, asserting that such events serve as little more than an exercise in “tedious sloganeering” and in “pumping up the party faithful.” It concluded that observers would “need to look elsewhere” for clues as to the Xi administration’s likely policy agenda. Tellingly, the article offered no suggestion as to where that superior source of insight might lie. No better source has emerged. To more effectively anticipate policy developments, observers should deepen their study of the analysis, theory, and policy documents produced by the central support staff and frequently issued under Xi’s name. The good news is that many of the most relevant and useful documents are widely available on the Internet. With careful study and mastery of these sources, analysts have within their grasp the means to better understand PRC intentions regarding strategy and policy. Tim Heath is a senior defense and international analyst at the RAND Corporation. He has over fifteen years of experience as a China specialist and is the author of the book, China’s New Governing Party Paradigm: Political Renewal and the Pursuit of National Rejuvenation, published by Ashgate (2014). This article was first posted in the Sinocism newsletter. A look at the implications of China's new Politburo Standing Committee.